Recently in the office we have been seeing quite a bit of shoulder injuries. They have ranged from rotator cuff tears all the way to frozen shoulder. I would like to briefly explain the anatomy of the shoulder so that you may better understand how some of these injuries occur, how we can treat them, and how you can prevent them. If you look at the image below, it shows the bones of the shoulder joint. You have the humerus, the clavicle and the scapula. The shoulder is what is considered a true “Ball in Socket” joint. This joint is very mobile in order to allow us to be able to put our arms and hands in almost any position. Because of the mobility, we sacrifice stability and this is one of the reasons this area is highly susceptible to injury. 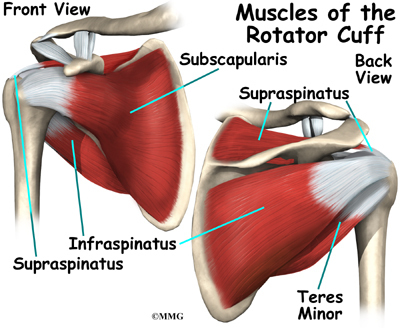 Next we have the muscles of the rotator cuff. These are the muscles that are commonly referred to when we discuss rotator cuff tears. The are four major rotator cuff muscles. The acronym for them is S.I.T.S. The muscle are the Supraspinatus, the Infraspinatus, Teres Minor, and Subscapularis. These muscle help keep the ball in the socket and help with some of the motions of the shoulder. The most commonly injured of these muscles is the supraspinatus. Some statistics say that in rotator cuff injuries it is the affected muscle 90% of the time. Most of the time these muscles are injured from overuse and repetitive micro trauma. Poor desk ergonomics can also stress the shoulder joint and predispose these muscles to injury. The next type of injury is “Frozen Shoulder” or adhesive capsulitis. AS the name implies, the shoulder movement just freezes. it can be due to injury, post surgery, or without any known cause. It can be a very painful and debilitating condition, and can last 1-3 years if not treated properly. So what can a Chiropractor do with shoulder injuries? The short answer is a lot. Dr. Cavallo specializes in the treatment of acute and chronic shoulder injuries. After you receive a comprehensive consultation and examination, the next step is to come up with a game plan to treat you problem. Treatment can include electric muscle stimulation, ultrasound, Cold Laser therapy, Chiropractic manipulations, exercises or any combination of those therapies. Sometimes before any treatment occurs, you will be sent to get an Xray or MRI of the shoulder to further assist Dr. Cavallo in treatment and management of your shoulder. If you are suffering with a shoulder injury or would like to learn more, please feel to call or email the office to schedule a consultation with Dr. Cavallo.